The business of small-scale grocery shop in Bangladesh is lucrative without any doubt. You must have noticed that the rate at which people start supermarkets and grocery store nowadays is high if you are observant. But, you should know one thing that people will not be rushing into it if the business is not lucrative. Also, it might be an indication that the business is profitable when you see people rushing into starting a particular business line. But, it doesn’t mean that we’re suggesting you rush into starting a business you know nothing about. Because it’s advisable that you do your own due diligence before you start any business. That’s why this article provides a basic guide on how you can start one when you’re considering starting a grocery store in Bangladesh. A small-scale grocery shop business in Bangladesh is actually not a small thing because you can’t start it with a little capital. Moreover, if you think about a supermarket, that requires huge capital as well. As the prospect of Bangladesh, grocery shop business is one of the profitable businesses in the small business industry. Although a grocery store still requires that you have sufficient capital, it depends on the size of the store. But, some of the capital should be spent on rent, furniture, freezer/ refrigerator, etc. Also, as working capital, you need to set aside adequate money. But, spending all your money on rent and not be able to stock the supermarket or grocery store with enough inventories is not worthwhile. And you need to stock different brands of the same product along with varieties of inventories. A small-scale grocery shop in Bangladesh is one of the good business options as the population is increasing and the purchasing power of the average person is rising. Also, people prefer to shop at those new age shiny grocery retail stores with the boom in the economy and increasing spending power. With products stacked neatly on the shelves in a complete AC comfort and where they’re treated to large shopping aisles. There are arranged orderly with their price tags and salespeople on their toes of the products like dairy, cereals, pulses, meat, cleaning items, and more. 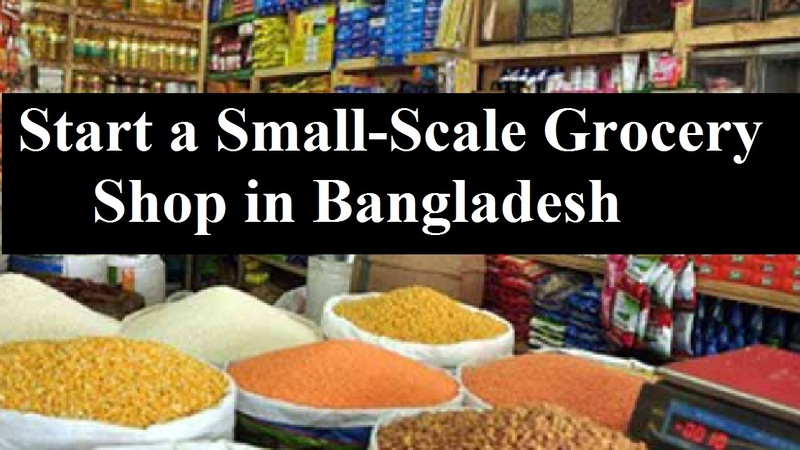 Well, let’s know in short how to start a small scale grocery shop in Bangladesh. You must draw up a business plan for it prior to starting up your small-scale grocery shop. Also, the competition that lies around you and your potential customers both must understand deeply. So, if you want to achieve success in this business then you must have an effective business plan and your market research should be accurate. That’s why when you’ll spend some time to analyzing your customer base it’ll help determine your market size and their buying preferences. Moreover, you’ll be able to determine the products you want to offer, select the right place to set up your shop and your pricing and selling strategy. As the customers’ base differs from one place to another and products used in urban areas would differ a lot from the products used in the rural areas, so the location of your grocery store is crucial. Moreover, it would dictate the kind of products you will need to keep in your store when you can find the age group of people in your customers. That’s why what you should do is to find out a prominent location at the center of town or at a busy market complex. You could get a good outcome from the center of the crowd as lots of people shopping there. Besides, as it will ensure you have a good amount of footfall every day, a good location is vital. Even you’ll need to spend a lot of money on air-conditioning, latest technology, marketing, and a lot more if you’re setting up one of the new age grocery stores. Most of the necessary requirements needed for running a household come from a mini supermarket or a small scale grocery shop. So, the area you want to set up your grocery shop in which would be within 1 or 2 kilometers of reach as your target market. Also, you must zero in on the best location for your small grocery store business for accurate target market assessment. That’s why if you want the perfect customer mix for your business, you should evaluate the potential of the business location. Deciding how much of financial expenses you will be incurred in setting up this business, it entirely depends up to you. Also, it depends on some factors like setting up the process, the size of the store, business plan or strategy etc. Moreover, if you start a new small-scale grocery store, you need to buy all the necessary furniture, freezer/ refrigerator, desk, and many more things to decorate the shop. For example, a freezer or refrigerator of medium price and medium size may be BDT. 25, 000, shelves of keeping goods would worth BDT. 15, 000 and other things are about BDT 10, 000. These are just for your shop décor expense and you have to decide how much you’ll expense for buying goods. Although you can buy goods in credit, you should start with some cash at first. It means that you can start your grocery store within BDT 100, 000. But, if you think a big one, you must add some 10 to 20 multiple of expenses. This is because a mini supermarket is not as mini as easily can write, which needs a big plan as well.